Before I get to some more serious discussion, here are a couple of small pieces for you to ogle. The first is a fairly recent piece that is completely hand stitched and beaded. I worked on it in small bits of time over a year or so. It was the piece I took with me when I needed some handwork to do at my weekly casual quilt group gathering. It is rather heavy with beads and embroidery floss! The title is: "With Silver Bells and Cockle Shells"
Here is another piece I did fairly recently which sold right away at River's Mist Gallery to our local newspaper owner. It is called "Haiku" because of its somewhat oriental feel and it is a small, simple piece. It received a lot of nice comments when it hung in the gallery. I have a bachelor's degree in Business Administration and one in Hotel Administration so I have taken my share of marketing and business classes. I am currently not working a 9 to 5 job where I would apply my education, but I find that I am using many of the skills for marketing and promoting my art and myself in the art/quilting community. I have been successful in getting my work into 8 different area galleries over the past few years and I am continuously showing work in three of them. I prepare paperwork to keep inventory records of what I take and pick up from these venues, I have images of all my work so I have a record of what it looks like, I make up price tags and artist statements and sometimes prepare an artist profile for these various venues, I rotate my work in and out every month or so to keep them fresh, I have insurance coverage for my work and I claim all my art-related expenses and income on my taxes. This serious business! I spend quite a bit of time organizing my inventory of work for preparing show entries and determining what can be entered where and what is available or in galleries. This is a very complicated task since each show has different requirements for size, type, deadlines for entry and length of commitment for the quilts, and some need the quilts to be for sale so they are then unavailable for entry to later shows until that show is over. I have a good inventory of pieces and I enter quite a few shows, so keeping track of what is available for a particular show can be difficult. My husband is in the process of creating a database for me that might help with this, but I don't think it will eliminate all of the issues. Some of the decisions I have to make are purely subjective like trying to find a piece to fit a theme or style of show. 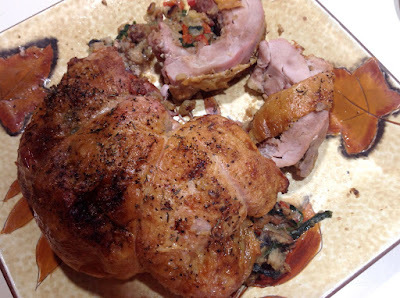 I try to keep my website and blog updated but haven't been as prompt with that as I should be. I have a slow dial-up computer connection and that makes it a chore to upload images to my blog and even get in and out of the management site for it. I am hoping to keep more current with my blog and vary my topics so that readers might actually feel like they get something out of it. I've tended to go on about my accomplishments more than anything else! I'd rather start sharing some knowledge about how I create my art and run my business. I have done some lectures and some trunk shows and a few small mini-classes and have found these things rewarding and fun---although I do get very nervous. I am trying to decide about whether to pursue the teaching thing right now and am leaning towards devoting time to writing instead of teaching. Maybe down the road I'll feel more comfortable charging people money to learn something from me, but now I don't feel I can devote the time and effort into it that will make it worth what I want to charge. I'd rather be creating! And writing I can do in little bits of time that I have available as opposed to the intense preparation of materials and curriculum for a successful class. I think I'm just not ready to be a teacher quite yet, but I'm still debating this. It is an interesting proposition when you are deciding to donate work to various causes. I have recently given several pieces to my church and will soon be selecting some for my guild's silent auction at their show in June as well. The pieces I gave to the church are for their fundraising efforts at the annual Outdoorsfest they sponsor. I had to ponder what to give based on whether the pieces were to be given out as "door prizes" randomly or if people would be bidding on them as auction pieces. It would be too bad for someone to get a quilt who had no use for it or interest in it. I know that I am giving them up and whatever happens to them is really none of my concern now, but it still would be sad! When I give them to a guild effort I know that whoever wins the piece or buys the piece will likely enjoy it so that is not as difficult. The pieces are not usually my best or most sellable ones but they are nice pieces that I feel comfortable using to represent me and my work. I don't want to give them really bad pieces that I don't think are any good, but I don't want to give up my most sellable or show-worthy pieces either. And larger pieces are difficult for most people to find room for in their homes so I usually give small pieces. Here is one of the quilts I gave to my church. It is one I made last fall that I really like and felt that it fit in with the outdoor theme of the event. It is called "Flyway". This next quilt is one my mom wanted to buy from me so I gave it to her. I really like the abstract imagery of this piece that really has a lot of feeling and evokes memories for me. I really enjoy creating pieces that are very abstract in nature but definitely are suggestive of something real. This one works for me. Friday evening (May 6) is the opening of the Bitterroot Artist's Showcase sponsored by SASS (Stevensville Art and Sculpture Society) at River's Mist Gallery. The reception will be from 6-9pm so please join us! Back to the studio to churn out some more work for my upcoming solo exhibit at Art City! I just completed a quilt for entry into the “Deep Spaces” exhibition being organized by Larkin Van Horn. I am very happy with how the piece turned out and very hopeful that it will get into the show. She is an artist that I greatly admire and I like the theme she chose. I'm sure there will be great competition, so I'm just hoping that my images can compete. The piece I made has three large cutouts and two layers added behind the cutouts to create depth and interest. It also has fabric leaves dangling from seed bead strands. Both of these techniques are ones that I use quite frequently in my work and really enjoy experimenting with. This was a rather dramatic experience for me in regards to the cutouts because they are so large. It is an interesting experience to cut large holes in a quilt that you have just spent a good deal of time creating, layering and quilting! Luckily I think it turned out well and if the piece does not make it into the show I will be happy to show it locally in one of the shows I have set for this year. 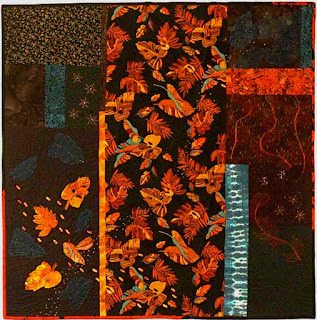 I found out recently that one of my pieces, “Glorious Leaves”, will be traveling with the Studio Art Quilt Associates (SAQA) exhibition entitled “Sense of Adventure”. 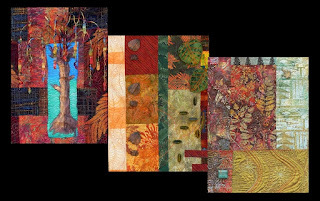 It will be first exhibited at the Houston International Quilt Festival which is very exciting. They are publishing a catalog for the show so that will be my first time having that experience. 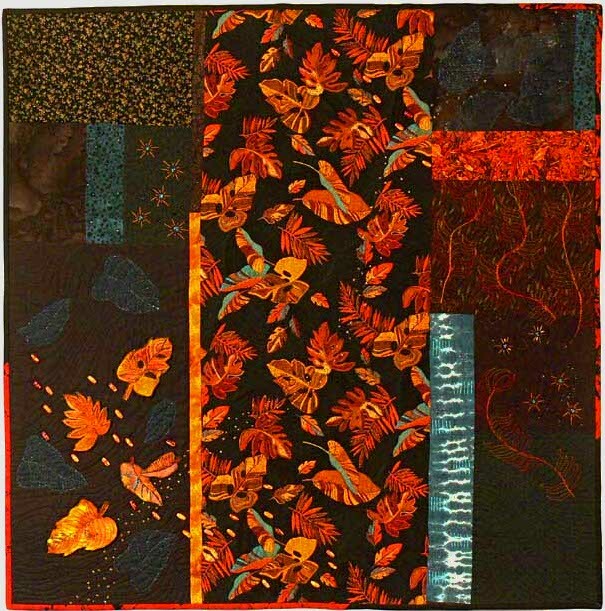 This piece incorporates some of my shibori dyed fabric and some hand embroidery along with the thread-painted leaves and extensive machine quilting. I am busy creating new pieces for my June/July solo exhibition at Art City in Hamilton, Montana. I just finished creating an image for a postcard. I was happy to be able to figure out how to collage some images together and put them on a black background and I am happy with the result. The show will open on First Friday, June 6 so if you are in the area please join me and see some new and some not so new work! Also, if you are in that area in May the Recycled Art Show is still up and there are some interesting pieces there. I have 3 quilts in the show made with plastic shopping bags fused together and combined with fabric and some other found or re-purposed items. It was a fun project to work on, but plastic is not my favorite medium! Last Wednesday I gave a presentation to the Bitterroot Quilter's Guild about my work and inspiration and it went very well. I had lots of nice comments and it is always good to have it reinforced how supportive they all are of my work. I think I was able to combine a little bit of education and information with some eye candy to make everyone happy! Now I am ready to do more programs like that for other guilds or fiber art groups in the region. Will have to look into that.... Will also have to work on reducing my nervousness. My mouth started drying up as soon as I got into the car to drive to the guild meeting and continued all the way until I was done with the program! Ready to start a new piece tomorrow after I attend my son's final field trip of the year to the Rocky Mountain Elk Foundation in Missoula. His school is getting out early this year (May 6) because of construction on the campus, so I'll have to work around him in getting new work ready for my show. I'm sure he'll be able to occupy himself for part of the day and let me get some things done although I will definitely not have the nice uninterrupted big blocks of time that I have when he is in school. It's ok---I enjoy having him around and taking him with me wherever I have to go as he is well-behaved and usually doesn't mind going places. Next week is my 48th birthday and I'm starting to think about that milestone coming up—50! Boy, I don't feel that old. Hopefully 50 is the halfway point since people seem to live longer and longer these days. I guess I'll have to get myself out from behind my sewing machine and get some more exercise so I can have one of those long lives too! !